Dave DelloRusso has discovered "the power of Christ." 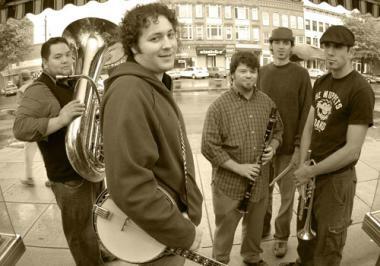 Founder of and banjo player for The Primate Fiasco, DelloRusso, with his fellow primates, can occasionally be seen playing the band's brand of Dixieland jazz on sunny Saturday afternoons in front of First Churches in Northampton, using the church's outdoors electrical outlet (dubbed "the power of Christ" by DelloRusso). The band is often joined by hula hooper Megan LaBonte and dancing fans of all ages. Although The Primate Fiasco isn't eligible for a busking (street-playing) permit in Northampton—the band has too many members and a drummer—its good-natured relationship with First Churches has earned it the use of the downtown courtyard. "We've got this really nice relationship with [the church]," said DelloRusso in a recent interview with the Advocate. "We've done fundraisers for them and played for the congregation. They told us to make ourselves at home in their front yard because they see the importance of bringing uplifting music to Main Street." Although DelloRusso grew up in the Valley—his love affair with jazz began in 2000, when he was a banjo player at Six Flags in Agawam—he spent the first half of the decade in Arizona. There he hooked up with Arizona State University grad student, saxophonist and clarinetist Steve Yarbo. The two played with a handful of musicians, including trumpet player and former Fiasco member Jay Mosall, in Phoenix until relocating to the Valley, where they joined forces with trumpet and tuba player Will Choe, trumpet player and vocalist Nick Borges and drummer Chris Trevethan. Shortly after arriving in Northampton in mid-2006, The Primate Fiasco took to the streets, making friends and fans. Early last year, the musicians headlined the Iron Horse for the first time, selling out the first of many shows at the renowned venue—not an easy feat for a local band. "Our first real gig in Northampton was in February of '07," said DelloRusso. "Right after we relocated here, we had started hitting Main Street, playing and handing out flyers and business cards. Then we played at the Iron Horse and it was sold out. People who saw us on the street brought all their friends. We were as surprised as everyone else. People came thinking they were going to see their friend's band and they were all kind of in shock [at how crowded it was]. I like to think that I speak for the band in that I think [the street] is my favorite stage—it's what kickstarted us." Although The Primate Fiasco is trying to stay in touch with its street roots, its plate is full this summer with the release of its first studio-produced album, Geek Dreams, a slew of private gigs, and an ambitious three-pronged endeavor, "Blow Up Northampton," made possible by a grant from the Northampton Arts Council. Inspired by the turnout at a free show the Fiasco performed at The Elevens in March, the project consists of five gigs—none with a cover charge—featuring performances by the Fiasco as well as bands from around New England. The band's hope in presenting these shows is to promote Northampton as a regional musical destination, further Primate Fiasco's fan base and offer music to more people, especially people who wouldn't normally go to a show with a cover. DelloRusso strongly believes in Northampton's role as a city for high-quality local, regional and national acts to play. He plans to use the grant money to pay for gas for bands to travel to Northampton to perform with The Primate Fiasco. After sharing Fiasco's audiences, the visiting bands, DelloRusso hopes, will book shows in town in the future. "Gas is the one thing still standing in the way of bringing in new bands, said DelloRusso. "We need to be able to give these bands $200 so they can break even. Then they'll be willing to come here next time… Why would you choose any town in New England to play in over Northampton? There's a particular type of community here& . People are very welcoming, the shows are more fun—the audiences are part of the shows, kind of like a private party. The natural resource here is people. I think it's our responsibility to do this for Northampton." Another driving force behind Blow Up Northampton is DelloRusso's brand of musical activism. The lack of a cover charge at a show, in his opinion, encourages reclusive people to attend. "A lot of people think that they aren't adequate, so they stay in and watch TV, because its easier," said DelloRusso. "But they can't stick out like a sore thumb at our shows because everyone there is from a totally different walk of life, and people just open up who are normally very shy and would be hiding in a dark corner or leaving early& When I saw that, I realized we were doing more than just entertaining people—there's actually something growing out of this, so it seems like almost an activism of sorts." DelloRusso's enthusiasm is infectious, both onstage and off. When he talks about his vision for putting Northampton on the map, his gusto leaves little doubt that he will accomplish what he's set out to do. "Dave is one of the community's recent arrivals and he's already become a big cultural catalyst," said Northampton Arts Council member and Iron Horse Entertainment Group Marketing Director Jim Neill. "He doesn't let rules thwart his missions. The dude abides, but does Jedi mind tricks within the rules. He makes things happen. He puts them in motion and people fall into his slipstream… . [DelloRusso] is an ideal candidate for an NAC grant& supporting this project and Dave in general is like giving a power pellet to Pac Man or something. He's going to do some serious chomping." The Primate Fiasco celebrates the release of Geek Dreams on Friday, June 27 at 10 p.m. at the Iron Horse Music Hall, 20 Center St., Northampton, (800) THE-TICK. Tickets are $8-10. For information about The Primate Fiasco's upcoming free shows (they haven't been booked yet), log on to http://www.primatefiasco.com.